Not a great turn out for the last of the season’s competitive games, the Tattie Bogle Mixed Doubles. For the second year running, there were more ladies than gents — 18 to 11 — so most of the gents got a second chance, as the first round losers were fitted back in. And, with it being an out-of-the-hat event, no-one knew who they were playing with. And, with the ladies holding the Orkney play-offs in Finstown, lots of the top ladies were missing. But that didn’t distract from some very good and close games and, by final time, two very good pairings were left, and it was Brian Stevenson and Flo Stewart who came out on top with a 2-1 win over Keith Brumpton and Doreen Kirkness. Craig Taylor and Craig Moar won the high/low fun boards scores. Ella Scollie helped run the event. A big thanks to all the players and everyone who bought tickets for the raffle. A total of £347 was raised for charity, which is the Talking Newspaper, and with the money already raised the total stands at £462. The only thing left now is the presentation night on Saturday in the Masonic Club, at 8 p.m. 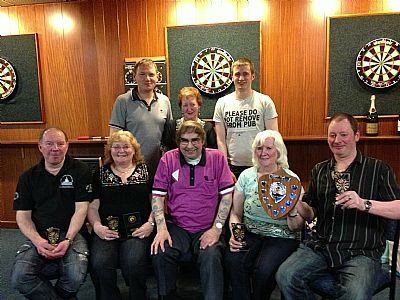 There will be mixed doubles darts, the trophy presentations, followed by karaoke. Players are reminded that entry is by ticket only. Any player who has won trophies should attend. Tickets are on sale from both secretaries, and cost £3. There will be registration books available for next season at the “do”. There will be a final committee meeting on Wednesday, May 22, in the Masonic Club, at 8 p.m.
That is it all for this season! The new season will start with the AGM, on Thursday, August 15. Brian Stevenson and Flo Stewart beat Keith Brumpton and Doreen Kirkness 2-1.